But forget all that for now – it’s fluff, and can be put aside for a while. This weekend, the attention switches back to the FA Cup, the oldest cup in all of English football, dating back to 1871-72, and still much treasured by … quite a lot of people, albeit a diminishing number. How highly regarded does the Cup remain? 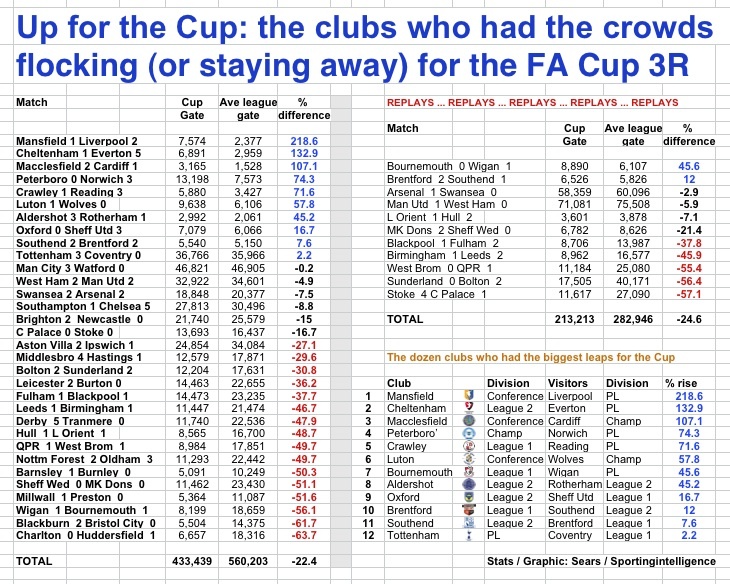 That’s what we wanted to find out from this season’s third round, and to do that Sportingintelligence looked at how the crowds for the Cup compared to the crowds for clubs’ league games. Ten clubs (from 32 at home in the third round) drew bigger gates than average in the initial games (not replays), including Tottenham of the Premier League against Coventry. Another six clubs fared worse than normal but held at least 75 per cent of their league home support. Beyond that, 10 clubs were between 25 and 50 per cent down on their average support, and six could not even hold half of their support. When replays are also considered, 12 hosts had better gates for the Cup than for League games. In total an average gate at the home clubs of 560,000 supporters dropped to 433,000 fans for the first 32 games – a decline of 22 per cent. And in the replays, the corresponding figures were 283,000 falling to 213,000, a drop of 24.6 per cent. The biggest percentage leaps were where ‘lowly’ clubs hosted those from several division above, such as Mansfield / Liverpool, Cheltenham / Everton, Peterborough / Norwich and Luton / Wolves to name just four. Tottenham’s hosting of Coventy was also interesting in as much as the crowd rose for what could be expected to be a humdrum win – as it proved, while Manchester City similarly drew a good gate for the win against Watford. The ties that involved two Premier League clubs attracted respectable numbers (West Ham v Man Utd, and the replay), Swansea v Arsenal (and replay) and Southampton v Chelsea. QPR against West Brom was the exception that proved the rule, but then QPR fans have other priorities. 1: Little teams against those who are relative giants. 2: All-Premier League games, which hold up well. 3: But not the rest v the rest, because even with some amazing ticket offers there were some massive drop-offs, as at the Riverside where seats were only £10. Perhaps a seeded draw might be the answer? On the basis of our conclusions, we’d expect Brighton to see a huge leap in gate against Arsenal this weekend, a big crowd at Macclesfield for the giant-killing of Wigan, a decent crowd at Manchester United for the beating of Fulham, and probably season’s best crowds at Brentford, Leeds and Oldham on Sunday for the respective visits of Chelsea, Tottenham and Liverpool.